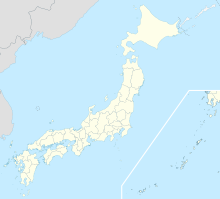 Shimofusa Air Base (下総航空基地, Shimofusa Kōkū Kichi) (ICAO: RJTL) is a military aerodrome of the Japan Maritime Self-Defense Force. It is located 5.4 NM (10.0 km; 6.2 mi) east of Matsudo in Chiba Prefecture, Japan. The base straddles the border between Kashiwa and Kamagaya cities. JMSDF Shimofusa Air Base is currently the headquarters of the JMSDF Simofusa Air Training Group, which is equipped with Kawasaki-Lockheed P-3C Orion maritime patrol aircraft and NAMC YS-11 training aircraft. It is also host to the JMSDF 3rd Service School and a detachment from the JMSDF Communications Command. In June 1945, the advanced echelon of the 18th Air Combat Group withdrew from the Philippines by heavy attrition in the Battle of Luzon. Immediately upon arrival in Japan, they joined with the rear echelon which consisted of 36 aircrews and 46 Ki-100s, and on 19 June 1945 the group reassigned to Matsudo Airfield for air defense missions over the Kanto Plain area. Consequently, the 53rd Air Combat Group was reassigned from Matsudo to Fujigaya and performed air defense missions until the end of the war. After the surrender of Japan, Fujigaya Airfield was occupied by approximately 300 troops of the Eighth U.S. Army on 27 September 1945. On 30 October, an artillery battery of the 112th Cavalry Regimental Combat Team which seizing Kashiwa Airfield was sent elements in to relieve the occupation troops at Fujigaya. By the end of the year, the airfield was placed under the control of Fifth Air Force and was redesignated as Shiroi Air Base, after the nearby town of Shiroi. Since then, the base was utilized as an auxiliary airfield and alternate Air Defense Control Center. There are two off-base/detached installations operated by USAF in support of Shiroi; aircraft control and warning radar site at Mineokayama Liaison Annex, and HF radio communications transmitter station at Funabashi Communication Site. In 1959, joint use agreement between USAF and Japan Maritime Self Defense Force was established at Shiroi, and JMSDF ground service crew training unit activated in place. As a result, all USAF assets left Shiroi on 12 December 1959. The base was completely returned to the Government of Japan in June 1960, then redesignated as JMSDF Shimofusa Air Base. Afterward, the JMSDF Fleet Air Force Headquarters activated at Shimofusa, then the base became an important facility for anti-submarine patrol aircraft's operations in Japan. In 1962, the runway and control tower were rebuilt, and the JMSDF Fleet Air Wing 4 was activated. With the partial release of U.S. Naval Air Station Atsugi in 1973, Headquarters JMSDF Fleet Air Force and the Fleet Air Wing 4 was relocated to Atsugi, and primary purpose of the base was reduced as a training facility. As the result, the JMSDF Air Training Command was relocated from JMSDF Utsunomiya Air Base (present, JGSDF Camp Kita-Utsunomiya) to Shimofusa. In addition, the JMSDF Helicopter Rescue Squadron has been stationed at Shimofusa from 1993. Ravenstein, Charles A. (1984). Air Force Combat Wings, Lineage & Honors Histories 1947-1977. Washington, DC: Office of Air Force History. ISBN 0-912799-12-9. Maurer, Maurer, ed. (1982) . Combat Squadrons of the Air Force, World War II. Washington, DC: Office of Air Force History. ISBN 0-405-12194-6. U.S. Far East Command, "FEC U.S. Telephone Directory, December 1955." Pershing Heights, Tokyo: General Headquarters, U.S. Far East Command. Document is on file at the United States National Archives (previously declassified and released under FOIA). War History Office, National Institute for Defense Studies, Japan Defense Agency (1968). Senshi Sōsho, Vol. 19, Hondo Bōkū Sakusen (WWII Air Defense Operations on the Japanese mainland). Tokyo: Asagumo Shimbunsha. This page was last edited on 17 November 2018, at 10:24 (UTC).